ALL OF YOU - Directed by Dan Villegas, produced by Quantum Films. 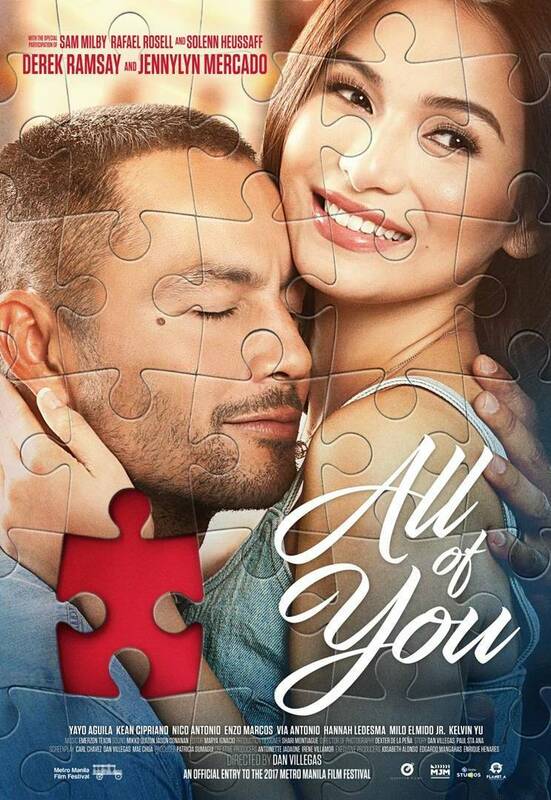 This a romantic drama that follows the love affair of Jennylyn Mercado and Derek Ramsay: how they meet and fall in love in Taiwan through a dating app, how they started their live-in relationship in Manila, how the relationship deteriorates and how they fall out love. Well acted by the two leads, this is a very engaging and realistic dissection of how relationships blossom and fail and, eventually, how it can be redeemed. 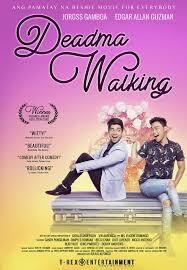 DEDMA WALKING - Written by Eric Cabahug based on his own award-winning screenplay and produced by T-Rex Films, this is the directorial debut of Julius Alfonso. Stars Joross Gamboa as a closet gay who learns he has a terminal illness. Eager to find out what his friends and family really think about him, he asks the help of a good friend, Edgar Allan Guzman, to stage his fake death and his fake wake so he can listen to his own eulogy. 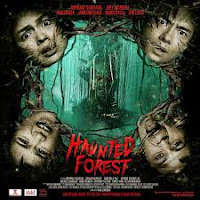 HAUNTED FOREST - The only horror film entry in the festival, this is produced by Regal Entertainment, directed by Ian Lorenos. This stars Joey Marquez as the chief of police in a town where young women go missing mysteriously. It turns out an evil elemental called Sitsit is getting them. Raymart Santiago plays a cop from Manila who relocates to the town with his daughter, Jane Oineza, who becomes another victim of the Sitsit. Also in the cast are young Kapamilya stars Maris Racal, Jameson Blake and Jon Lucas. this is a wholesome comedy about a family that’s on the verge of breaking up. Vic Sotto and Dawn Zulueta play a couple who were just forced by their parents to marry each other. They beget three kids: JC Santos, Gabbi Garcia, Baeby Baste. The fact that theirs is an arranged marriage takes its toll on their relationship but their kids try their best to make their parents fall in love with each other anew and reconcile. Also in the cast are Andrea Torres, Daniel Matsunaga, Sue Ramirez, Ruru Madrid. ‘LARAWAN, THE MUSICAL’ - With songs and music by Ryan Cayabyab, this is based on the classic play of National Artist Nick Joaquin, “Portrait of the Artist as Filipino”, about the passing of an era as represented by the Marasigan family just before the Second World War erupts. Rachel Alejandro and Joanna Ampil play two spinster sisters whose lives were ruined by the arrival of an outsider, Paulo Avelino. 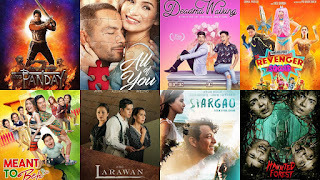 Also in the cast are Sandino Martin as the narrator, Robert Arevalo, Celeste Legaspi, Zsa Zsa Padilla, Ogie Alcasid, Rayver Cruz, Cris Villonco, Aicelle Santos, Nanette Inventor, Noel Trinidad and many more. ‘SIARGAO’ - Directed by Paul Soriano and produced by Ten17 Productions, this movie aims to promoteject the breathtaking beauty of Siargao in Surigao del Norte, Mindanao as one of the country’s finest tourist destinations, with lots of surfing scenes and underwater photography. The story is said to be about finding and losing yourself, falling in and out of love and giving love a second chance. 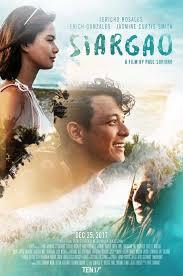 It stars Jericho Rosales, Erich Gonzales and Jasmine Curtis Smith as the three major characters in the story who are all brokenhearted. 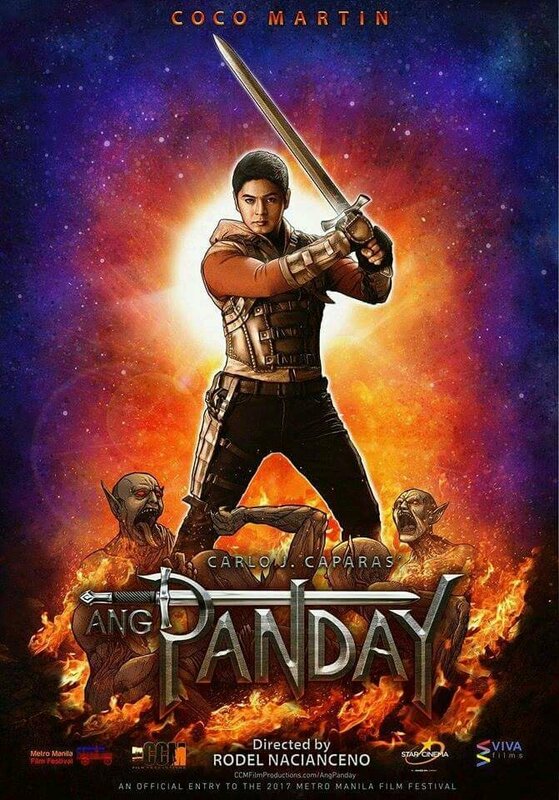 “Ang Panday” - Nth remake of FPJ’s classic action-fantasy based on the komiks novel of Carlo Caparas, directed by Coco Martin using his real name, Rodel Naciancieno. This is a co-production between his own company, CCM Productions, Star Cinema and Viva Films. Coco now plays the grandson of the original Panday and is still named Flavio. 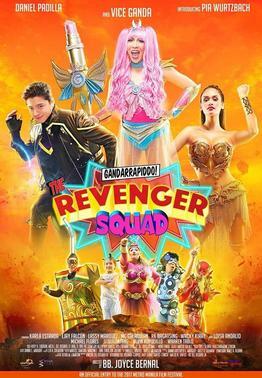 The star-studded cast is led by Jake Cuenca as the villain, Lizardo, along with beauty queens Mariel de Leon and Kylie Versoza as leading ladies, supported by Gloria Romero, Awra Briguela, Jaime Fabregas, Elisse Joson, McCoy de Leon plus the cameo appearance of about 100 stars most of whom have worked with Coco in his TV hit, “Ang Probinsyano”. Films co-production, this is an action-comedy-fantasy with Vice Ganda, Daniel Padilla and Pia Wurtzbach in her first movie after winning Miss Universe. They play superheroes fighting crime. Also starring Ejay Falcon, Karla Estrada, Wacky Kiray, Loisa Andalio and RK Bagatsing. Directed by Joyce Bernal.